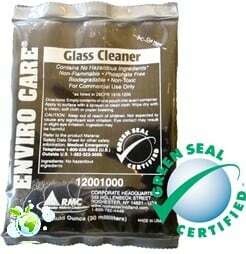 Glass Cleaner Click or Dial (720) 746-0803 for your environmentally friendly EnviroCare Glass Cleaner giving you streak free experience on glass, mirrors, stainless steel and other polished surfaces. This product meets the Green Seal environmental standard for cleaners based on its reduced human and environmental toxicity and reduced volatile organic compound (VOC) content. Each 1.0 oz EnviroPak packet makes 32 oz (1 quart) of ready-to-use cleaner. Dilute the super concentrate with cold tap water and put it into a 1 quart spray bottle. Use your own or buy our high quality EnviroCare Glass Cleaner Spray Bottle that is already properly labeled for you. Our 1.0 oz EnviroPaks are available for you if you do not use a lot of cleaner or do not have the space to store it. Requires spray bottle. First let me tell you that I am a Green Housekeeper and secondly I should tell you that my mom brought me the products she purchased from you to try out in the hopes that you and I may find each other’s businesses mutually beneficial. I usually use scented (with natural essential oils) vinegar to clean glass and to disinfect, and a product called Citra-Solv for polishing, grease removal and floors. I must say I was very much impressed with the products she gave me. With vinegar and a dry rag I must apply heavy pressure and repetitive motion in several different directions to remove streaks, but not with EnviroCare Glass Cleaner. Two light passes and the window was not only sparking, it was also streak free! You saved me elbow grease and time – the foundations of my business. Thanks! I really like the EnviroCare window cleaner for sure. 🙂 I will be adding this to the products we use in my business, 360 Degree Solutions. Thank you so much! Thank you for the EnviroCare Glass Cleaner Concentrate. I found it easy to mix and use. It leaves my bathroom mirrors and doors streak free and shiny!! Very little effort to get the job done. Such a great, enviro friendly product! We have been trying the concentrate for about a month and, not only does it get the job done, but it doesn’t leave that chemical smell! Would definitely recommend this if you want a natural cleaner for your home! This is a great product. Cleans great and is streak free. Thank you so much for the Glass Cleaner. It is very important to me as a mom and some sensitive to chemicals to find products that are effective yet safe to be around. This product fits the need!